Excellent bright finished T-shape blade with French maker's name Mre. d Ármes de St. Etienne, Julliet 1876 on blade spine. Hilt altered by grinding away the upperpart of the brass pommel over the intire length so reducing the depth of the slot and adding an unique replacement for the locking tooth. Excellent bright crossguard, curved quillon with final and muzzle ring MRD 17 mm. Two French markings on ricasso and three more on the quillon. Very good wooden grips. 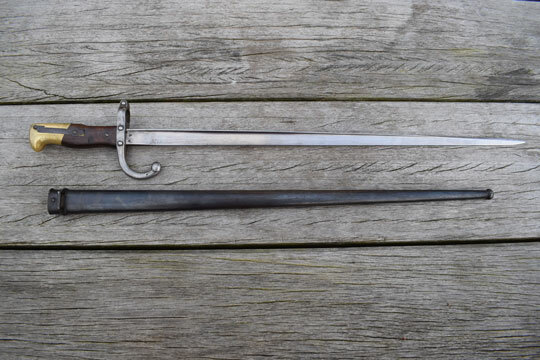 Excellent blued metal scabbard with no dents. This is one of the only 5.000 former French M 1874 Gras bayonets, modified in Germany and supplied by Benny Spiro of Hamburg, Germany to fit 5.000 M1888 Commission rifles. In 1914, prior to the outbreak of WWI, these rifles were smuggled illigally into Ireland by the Ulster Volenteer Force (UVF). This became known as the Larne Gunrunning.